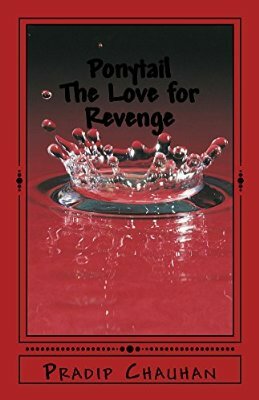 THE WRITING BUDDHA - Opinions | Books | Movies: Ponytail: The Love For Revenge by Pradip Chauhan (Book Review: 2.25*/5) !!! Ponytail: The Love For Revenge by Pradip Chauhan (Book Review: 2.25*/5) !!! And finally I ended my Reading Marathon of this first half of the year with the novel "Ponytail: The Love For Revenge" by Pradip Chauhan. The cover page of the book is quite appealing. This 172-pages novel got completed by me within a single sitting of 2.5 hours and it's a light read that can be definitely read while traveling. Pradip Chauhan has written this book in a very simple and easy language. The sentences formation has been short. The chapters are also divided in very small parts which helps you remember what happened in previous chapter even if you take breaks while reading. I liked how author have kept the story short without dragging it with unrelated events. Talking about the good points: I liked how author revealed the secret behind protagonist's ponytail in the pre-climax which was being discussed so much that I was thinking why is whole focus being shifted towards a character's hairstyle every now and then. I liked some business insights given by the author through the conversation that the main protagonist has with his colleagues, competitors etc. mainly in the first half. How protagonist's life is connected with that one painting is something I really appreciated in the book in terms of story. I feel that this book could have been far better if author would have inserted many more thrilling moments in the second half as the plot totally permitted the author to play with the characters and story. Every time, author has tried to take story to next level, he fails badly in the very next chapter as he brings everything to a normal story-telling level. Also, even after showing his first love so aggressive and emotional, it wasn't convincing that the character keeps falling in love eventually with two other girls after her. The suspense regarding Tapasya's death is nicely disclosed in the end but the word "revenge" which is so passionately used in describing this story isn't portrayed impressively. And too many deaths in the end is also a let down. Overall, I would say that author can improve with his next flick by reading bestselling thrillers as he surely has talent to tell a great story. I give this one 2.25* out of 5.